UK WILPF has submitted two reports to the Convention on the Elimination of Discrimination Against Women (CEDAW) for its upcoming review of the UK’s Eighth Periodic Report. UK WILPF contributed to the pre-sessional Working Group of the Committee in July 2018. 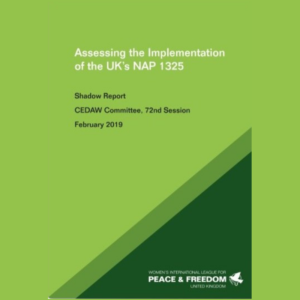 The first report, ‘Assessing the Implementation of the UK’s NAP 1325’, looks into the UK’s implementation of its fourth National Action Plan 1325 covering the period from 2018 – 2022. A copy of the report “Assessing UK Government Action on Women, Peace and Security in 2018”, by GAPS UK, a network of which WILPF UK is a member, is also provided as an Annex. 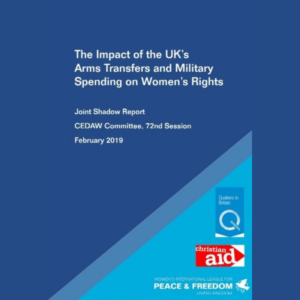 The second report, ‘The Impact of the UK’s Arms Transfers and Military Spending on Women’s Rights’, was prepared in cooperation with Christian Aid and Quakers in Britain. This report focuses on the UK’s arms transfers to several countries, foremost among which is Saudi Arabia; and the UK’s increasing military spending and plans to update its nuclear arsenal, which are in sharp contrast with the deep cuts of public services undertaken in the name of austerity. You can read both reports in full here.